While the intentions of the anti-seal activists are laudable, in at least the case of the Inuit people, the indiscriminate strategy of undermining the market for sealskin has had a profoundly negative impact on the Inuit people who do not really have an option to move to a second income source. This has resulted in an increased loss of income and added to food insecurity for the Inuit people. Commercial seal hunting has a conflicted reputation. Atlantic coast fishermen hunt harp seals to supply tanneries with skins and pharmaceutical companies with Omega-3 fatty acid-rich blubber. Seals off Namibia are also hunted for commercial purposes and that government emphasizes killing pups to prevent population increase because the government suspects the seals add to the mortality in other fisheries. Unlike the Atlantic coast seals, the seals off Namibia are also a tourist attraction. The tourists bring in approximately $2 million per year whereas the commercial harvest only brings in about $500,000. 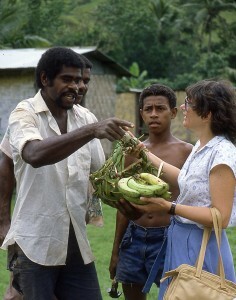 In 1983, I led a research team to Fiji to collect specimens of coral fish. Fiji is an ancient piece of a continent so has a different habitat and different geological history from the coral atolls in other island groups. The assistance of the Royal Ontario Museum, private donors, University at Suva, the Department of Fisheries, and many other organizations made it possible. The slides shown here were taken in a variety of locations and for anyone who currently lives in Fiji it will probably be a bit difficult to recognize the locations. For the time we were there, we donned local clothing and lived with the local people on the various islands that we visited. Canada’s failure to meet the obligations of treaties agreed to in good faith, the segregation of the native population into small isolated “reserves” on unproductive ground, the removal of the automatic right to hunt and fish other than for subsistence, denial of use of the timber, and denial of right to mine or benefit directly from the the minerals, the removal of the right to make what most would think of as normal everyday financial decisions, the past history of forcible removal of children from families, continued attempts to extinguish cultural norms and language, entrenched dismissal of the value of traditional knowledge in decision-making capacities, the imposition of a foreign form of internal government (formerly decisions by Elders and hereditary Chiefs in consensual gatherings), the continued failure to meet the Canadian constitutional guarantees of fiduciary care by the federal government, and the imposition of the Indian Act which effectively makes Native People wards of the state unless they agree to assimilation. Canadians in general and Canadian politicians in particular owe the Native People more than just an apology. Diverting the equivalent of the cost of the G20 directly to addressing the backlog of housing issues for the next 2 years would effectively end the housing “crisis”, but would not solve all of the problems. The most pressing needs I have personally seen are in rebuilding the capacity of the Native People to move into the future using their own initiatives and decisions within the modern contexts of their own cultures, languages, and knowledge systems, including the ownership rights to the land they still have under treaty and the ability to directly control, manage, and if appropriate to use the natural resources on and in the land for commerce. A transition away from the Indian Act needs to be negotiated in good faith by the nations of the Native Peoples and the Canadian government. I am sure there are many other pressing needs the Native People want to have addressed, and Canada and Canadians should hear those statements by the Native Peoples. An exciting new science fiction novel presenting some of the challenges that might face explorers to a new world with a different underlying evolutionary history. Copyright © 2011-2019 KIVU Nature Inc.